For many, it's more fun than buying online or at warehouse-style setups like bankrupt Toys R Us. Ella Wiesenfelder has been coming to Barstons Child’s Play her whole life, so naturally it’s where she wanted to be on the afternoon of her 8th birthday. She had already picked out a Lego spaceship and a magic kit with 150 tricks for herself and was now helping her 6-year-old sister, Cora, make a selection. “How about this?” she asked, holding up a pony that changes colors in the bath. Ella and Cora, it’s fair to say, are not Toys R Us kids. Last week, the big-box toy retailer filed for bankruptcy protection after a long, losing battle to sell its own brand of fun. Competitors have pulled ahead with better customer service in stores and better shopping experiences, prices and selection online. Ultimately, though, it was a heap of $7.9 billion in debt – mostly dating to a 2005 leveraged buyout – that did it in. If Toys R Us is a private-equity horror story (not one for the kids), then mom-and-pop neighborhood toy shops are more like a fairy tale. Here at Child’s Play in Washington, D.C., annual sales have been climbing about 3 percent a year as parents eschew megastores and online options in favor of the company’s four locations, which together bring in millions in annual revenue. On a recent weekday afternoon, the store bustled with children. Their parents in tow said they come to the store regularly because they like the carefully curated selection, helpful employees, Lego-building events and the gift wrapping, which can come in handy when you drop in on the way to a birthday party. Throughout the country, experts say, independent toy stores are seeing a revival as parents – and their children – look for unique shopping experiences that stand out at a time when so many of their shopping habits have been reduced to impersonal clicks of a button. 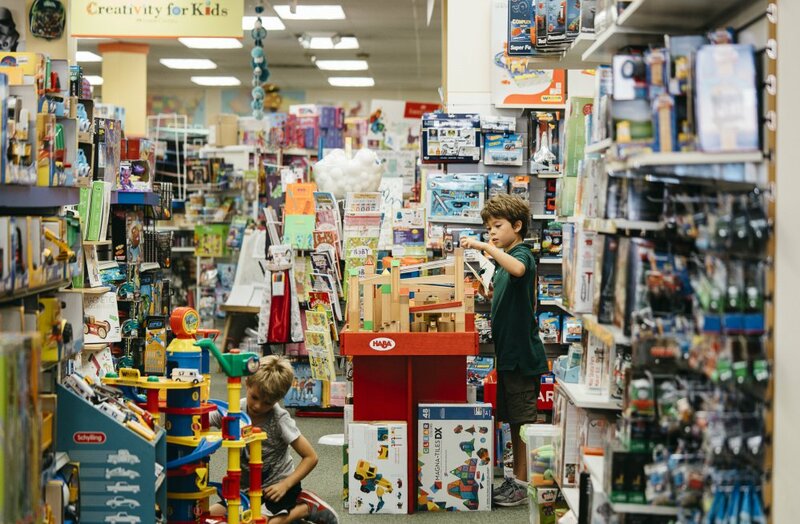 While adults may be inclined to compare prices or shop from their living rooms, children would rather take their allowances and birthday money to a store that allows them to play and explore. It’s a wildly different story than at Toys R Us, which for decades was the country’s preeminent toy retailer, with a towering flagship in New York’s Times Square and a ubiquitous icon, Geoffrey the Giraffe. The company had been in free fall for years, and analysts said the bankruptcy filing was inevitable. That kind of fun is what Child’s Play has figured out and perfected over three decades. Its sprawling store in the tony Chevy Chase, Maryland, neighborhood is a maze of displays and play spaces. There’s a Lego section and a fake-food section and designated areas for costumes, water guns and puzzles. Sprinkled throughout are bathtub crayons ($6.99), Elmo puppets ($18.99) and scooters ($129.99). The toys at Child’s Play are chosen with help from developmental psychologists, occupational therapists and teachers. Staffers are trained extensively in child development and are taught to recommend items based on specific considerations. Need to work on your toddler’s finger strength? Employees might recommend Play-Doh. Have a child who has trouble losing? Cooperative games such as Forbidden Island or Mole Rats in Space may be the ticket. Benjamin Mack was standing in front of the Star Wars Legos. This is, he said, where he comes to spend the monthly allowance he earns doing chores around the house. Once he earned $21 in one month. Today he was empty-handed. “I usually focus on the $10 sets, which are more affordable for me,” he said. He and his 5-year-old brother, he said, live nearby and like to stop in after school. Nearby, a shopper remembered how employees had tracked down an obscure ancient shark figurine for her twins. Another recalled the time employees opened a board game so her 7-year-old son, Ben, could decide whether it was the right gift for his friend. Taking toys out of their boxes and showing how they work is an important part of the job at independent toy stores. It’s also the main reason why companies such as Haba, a German toymaker that specializes in wooden toys, only sell to independent retailers. Back by the board games, Ella and Cora were still looking for the right toy. Their latest selection was a laser tag set for $49.99.